“It’s my birthday card from Broken Hearted Toy!” Photo of Clarke from Hollies tour book. 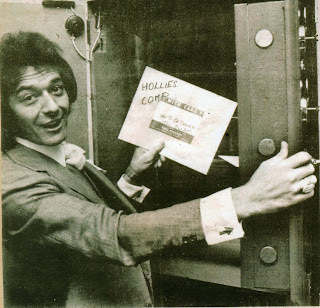 Allan Clarke has an added reason to celebrate his birthday this year, having just been inducted into The Rock And Roll Hall Of Fame with The Hollies. Clarke served as the band’s lead vocalist from the very beginning until his retirement in 2000, although there were a few times in the 1970s when he went AWOL to pursue a solo career. His distinctive voice can be heard on several Top 40 Hits, including “Look Through Any Window,” “I Can’t Let Go,” “Long Cool Woman,” “He Ain’t Heavy, He’s My Brother,” and “The Air The I Breathe.” He also composed several great songs, as part of the GRALTO songwriting team of Graham Nash, Allan Clarke, and Tony Hicks. In addition to his tenure with The Hollies, Clarke also scored an FM radio hit by singing lead on “Breakdown” from The Alan Parsons Project’s I Robot album. He discovered Bruce Springsteen before many people had heard of The Boss, and performed Springsteen material on his solo releases. Springsteen was in the audience when Clarke reunited with Nash for a performance at The RRHOF Ceremony. Happy Birthday, Allan. Thanks for all the great music, and congratulations on your well deserved award.